Having met Sandra Affleck, Chair of Kirriemuir Heritage Trust, I am looking forward to next year’s celebration of the life and work of Kirriemuir’s own J M Barrie. It was an enormous pleasure to talk to Sandra and discuss her experience with organising the Barrie Celebration. We discussed the need for more tourist accommodation, proposals for developing Kirriemuir Hill, Kirriemuir residents’ modesty about their heritage and the opportunities for celebrating the town’s illustrious past. I am looking forward to a varied fortnight of events to be held from 7th May next year, and I hope that people from all over Angus, and Barrie’s fans from around the world will join Kirriemuir residents in celebrating his contribution. You can find out more about the celebrations on the Kirriemuir Heritage Website, by clicking here. I am also backing proposals by Angus Council to enhance Kirriemuir Hill in time for 2010’s celebration of J M Barrie’s 150th birthday. 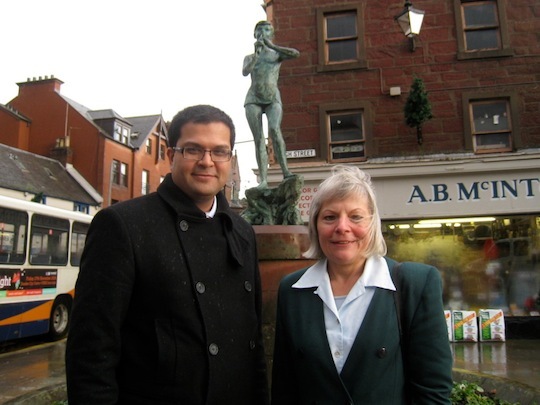 The proposals not only celebrate J M Barrie, but also take advantage of this anniversary to improve facilities on the hill for all Kirriemuir residents. During my visit to Kirriemuir, I also took the opportunity to visit the Gateway to the Glens Museum, the plaques celebrating J M Barrie, Charles Lyell, Bon Scott, Sir Hugh Munro and recipients of the Victoria Cross, along with a tour of local shops and places of interest.